The Lake District is England’s largest National Park and now a World Heritage site. We will start our day in the Lake District by visiting Ullswater, the second largest lake in England and with the nickname “England’s most beautiful lake”. It is 9 miles long and as deep as 60 metres in some places. 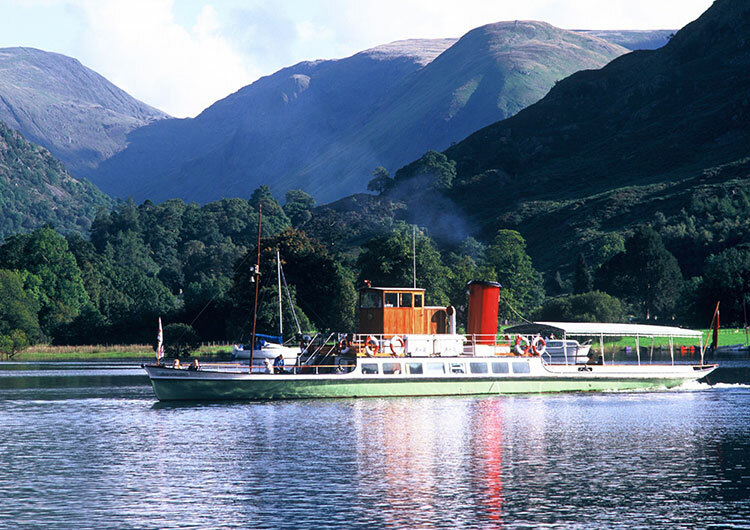 What better way to see this glorious feat of nature than by boarding the famous Ullswater Steamers for a wonderful one-hour trip on Ullswater, from Pooley bridge to Glenridding. You’ll see the pretty Lakeland village of Pooley Bridge, which was once an important fishing trading areas with its origins dating back to the 16th Century. Glenridding – in front of England’s third highest mountain – is where we finish our cruise. Excellent facilities onboard include open deck and covered upper deck seating areas in addition to covered downstairs saloons, licensed bars and toilets. Excellent facilities also located at the Pier Houses including free Wi-Fi. Most of our customers enjoy lunch on board the Steamer, although there are café facilities after disembarking. We will then drive to Ambleside, a small town within the Lake District. It is situated at the head of Windermere, England’s largest natural lake and probable the most famous of all. Thanks to Ambleside’s magnificent setting at the head of Lake Windermere, there’s plenty of things to do in Ambleside. For a start, just enjoying a coffee or a stroll and gazing at the beauty of Windermere is a must. But there will be plenty of time for other enjoyment. A walk around Ambleside, a small and traditional Lake District town, is a lovely way to spend a few hours. There are many restaurants and other places to eat in Ambleside and an exciting range of arts, crafts, jewellery and interior design shops. Visit the Armitt Museum to learn about the town’s history and local characters including John Ruskin and Beatrix Potter. Discover the iconic St Mary’s Church and Bridge House, one of the most photographed buildings in the Lake District and a popular subject for many artists, including Turner. Our Lake District day excursion – including an Ullswater cruise - is one of the most popular and its easy to see why. Book now and enjoy a wonderful day out.